February 8, 2019 | This would be an unpopular post among photographers, but I post it as food for thought for the average consumer, who is considering custom photography. There are marketing buzzwords (“luxurious” and “photo experience” are the top two that make me cringe, personally) that will generally propel you into a stratosphere of paying higher rates. There are independent photographers who have beautiful work and high quality, legacy products - and they are likely using the very same vendors to produce them as the shops that promote themselves on the higher end. I’ve said this before and I’ll continue to drive this point: custom pet photography should be accessible to everyone who loves their pet. Pet parents shouldn’t be priced out of the opportunity to create lasting memories of a relationship that is so meaningful. Maybe you are among the short list of families for whom money is no object. If that’s the case, I am so happy for you and for the pets you love and spoil! But if you are like most of the population, you very much love your pet, and you have an idea that you would like to capture this time in their lives and in your journey together. You know there is some cost associated with it, but you also would like to end up with more than one print or piece of wall art. If this is you, do reach out. Over the years, I have honed a menu of offerings and a price list that works to ensure clients have OPTIONS that are affordable. Do I shoot and burn and give you a bunch of digitals for you to figure out? No, because I prefer NOT to hand over a thumb drive that will sit in your desk. I truly believe in the tangible results – the art you pass by your walls every day, the album you can show off to your guests. I want these things for you. And so I have made them affordable for you. I always take into consideration clients’ concerns and never would talk someone into a piece they could not comfortably order. My goal is for you to be completely satisfied with your decisions and to enjoy the lasting memories we created of you and your much loved pet. So if you are thinking of a session but are on the fence, please get in touch. I'd be happy to walk you through it. February 3, 2019 | Yesterday was the Pup Bowl Event for Charleston Animal Society - thirty puppies were in the game and I know at least MOST of those pups slept in their new beds last night and not in a foster home or in the shelter! I was so uplifted to see the faces on the adopters as they chose their new best friends! I asked a couple of people what made them adopt -- one lovely family was looking for a buddy dog to raise with their child, one adopted for their other dog, who they felt was lonely... the reasons were varied but the people had one thing in common: HUGE HEARTS open to loving a new pet. January 20, 2019 | After a couple of weeks of much-needed downtime following a CRAY-ZEE December, I am back in full swing with client and rescue work - I hope you all are enjoying this new year so far - I surely am! December 30, 2018 | I've been looking back at my year with gratitude for all the opportunities I have had to work with such awesome clients as well as serve the rescue community through photos of adoptables. I'm also grateful for the local community's support and your votes in the 2019 Best of Mount Pleasant. I am humbled and appreciative of this recognition for the 2nd year in a row and will do my best in the coming year to continue to provide the same high levels of service, skills and quality clients expect and deserve. There is, at times, a lack of understanding that pet photography is an actual specialty. I have worked hard to try to change that message and I hope the tide is turning. Not everyone with a camera can capture your pet's personality - not everyone will go the distance for "that moment". There is so much more to this than simply snapping the shutter. And I will always go that extra mile for you to make sure that your love for your pet, and your pet's sweet spirit and true personality, are documented and properly preserved. Also, this year I have photo'd 548 adoptables, with one more shelter photo trip to go on Tuesaday -- that's only a fraction of the homeless animal population. So while I don't balk at responsible breeding, I do encourage everyone to please consider adoption as your first option. After tomorrow, I'll be winding down for a few weeks (I like to call it "Jeanneuary") as I promised my gear a much-earned break and my dogs some hang-out time. I wish you all a beautiful holiday season! October 17, 2018 | HOLIDAY ORDER NOTES - If you are considering photo gifts, prints/products as holiday gifts, your order must be received by 11/26 to ensure processing and delivery for the holidays under regular shipping rates. Orders received 11/27 or later will incur expedited shipping charges. Only digital image orders accepted after 12/17/18. October 14, 2018 | In response to client requests, I'm rolling out new pricing this week that includes a number of package offerings for wall art as well as print and digital collections. This should make it a little easier for you when it comes to making decisions about what to hang on your walls! September 21, 2018 | Over the last decade, I have worked hard to keep my service and product rates affordable. So the question I have is: Can you afford NOT to commission custom photos of your beloved pets? Your pet is young and healthy. They have been with you for a few years now, maybe since they were a puppy. You didn’t seek out professional photos when they were a pup so maybe you have missed capturing that stage in anything more than cell phone quality. You can’t turn back that clock - and maybe you feel that’s fine for now. But those fuzzy selfies may not be enough in a few years when you are missing your furry BFF. Will the martian-eyed photos taken with a cell phone flash allow you to really remember how deep and soulful your pet’s eyes were? Would you rather have a beautiful album made that allows you to honor their time with you with every flip of a page? Would you like to enjoy your morning coffee looking over a gorgeous piece of wall art that depicts a very special day when you and your pet had a fun photo session together – moments seized by a professional, someone skilled at capturing that connection, and then having a high quality output to back it up? I don’t dispute the value of spontaneous cell phone photos – I do it myself (and truth be told, I delete most of them because of their limited quality). I don’t rely SOLELY on them to document my pets’ lives and my journey with them. If you value the time with your pets, by all means, please have it documented (or “dog”umented) properly. If it feels like you can’t afford it, call me or email me and let me walk you through it and then decide. I bet you’ll be surprised how much it DOESN’T cost once you really look at numbers. July 19, 2018 | In just a couple of weeks, Roux and Gracie are both turning four! Where does the time go?! We'll be celebrating all month really, including our own "par-tay for the pups" as well as special offers for clients, starting with a mini-session offer on August 26. Watch for other specials throughout August! 1. I use third party pro labs and rates are subject to change from time to time. Clients are given rate sheets at their session and current rates are available in the proof gallery menu. Scheduled clients who, after reviewing site and Guide info, further inquire specifics for their own estimating purposes are provided additional info as well. But as a rule, no, I do not publish print/product rates (but my session fee, any related trip charge and the ordering minimum are published and easily accessible). 2. 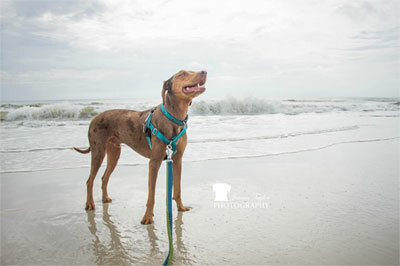 While I understand being budget-conscious, custom pet photography (or any custom photography!) is not a decision that should be based on price alone and publishing rates encourages some folks to simply price shop - that is NOT how the decision should be made. You can certainly find a shoot-and-burn photographer (usually newcomers) who will give you a batch of “edited” images for a small fee (and that may be good enough for you), but that isn’t how I work. In the comparatively nominal session fee that I charge, my time, years of studies and practice, my experience and talent, over a decade in business – these are the pieces the session fee covers and the value of time invested in each session far outweighs the fee. I develop ongoing relationships with clients because I am genuinely interested in them and their pets. It isn’t just a work task to me. It’s a passion. If you decide you want to work with me, base it on my my style and because it's a good match for what you envision for your session. My rates for prints are products are very affordable. I also offer rescue, military and LEO discounts. If you have booked or are thinking of scheduling, for goodness sakes, don’t be shy. If you have a question, ASK ME! MPM, thank you for understanding the value and the importance of documenting our pets' journeys! 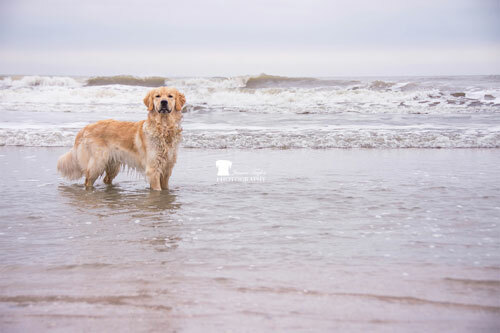 March 2, 2018 | Yesterday, I had an awesome morning beach session with two gorgeous golden retrievers and their humans. The dad contacted me with a requirement that the session be held within three days (it would seem an odd request if they were local but, they were visiting from Pennsylvania and their six-week stay here was coming to a close). When I asked where they learned about me, they said they had picked up a copy of the Mount Pleasant Magazine (the 2018 “Best Of” edition ) and voila! There I was! So for those who voted me into this award, thank you - because of you, I had a fantastic morning with two beautiful and friendly dogs, two lovely humans, and perfect lighting for my taste! 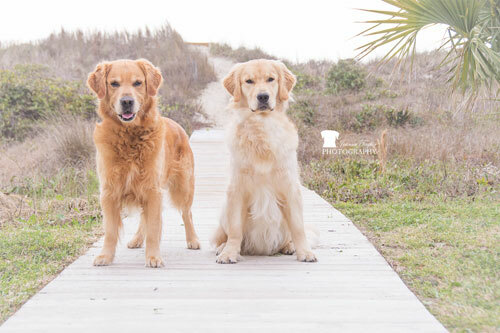 The dogs gave me so much personality that their session yielded over 120 rough proofs! Full-size copies of these images can be viewed on Facebook. January 18, 2018 | This new year is off to a great start! We had SNOW (which meant some awesome and unexpected photo opps). I was also honored to learn that I was voted Best Pet Photographer in the 2018 Best of Mount Pleasant (see sidebar for link). 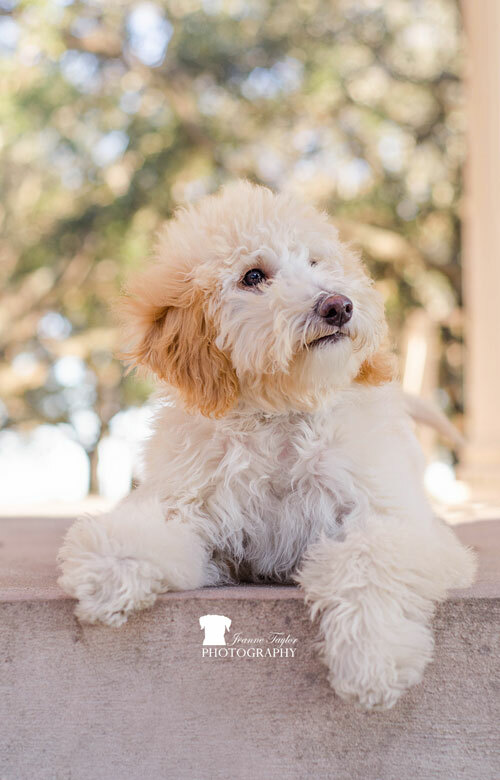 And I am happy to launch my Puppy "Grow With Me" photo packages, which should be an easy commitment for EVERY puppy parent! Please click here for details. - keep honing my craft. I will continue to focus on pets (and their people), thereby ensuring I don't dilute the special services I offer, or turn into a "shop". I love what I do!! I love that it's a specialty and not something that everyone can or does offer. (Including a pet in a photo or two simply isn't the same as a dedicated pet session.) Happy New Year to all of you readers! The best part is 2018 is the YEAR OF THE DOG! September 10, 2017 | I continue to preach the benefits of custom pet photography. I see folks claiming to be pet photographers posting enormous galleries of blurry images and, because most people don't know that custom pet photography is "a thing", they assume those are the only type of photos available and they accept that as industry quality. I am here to tell you, that is NOT the case. Some of us have worked for years to hone this skillset, to ensure only true quality images survive the cut (technically correct images that show your pet's personality and make you FEEL something), and to prepare for our clients the best possible images of their beloved companions. Don't settle for less. Owning a camera (or a dog) does not make someone a pet photographer any more than owning a stove makes you a chef. Think about it. August 25, 2017 | Those who know or have worked with me in the past will tell you I will always lend a hand to a rescue group if they ask. This year, I drove myself a little bananas with several photo projects all at once though: 2018 calendar for local rescue My Name is Milk; the 2018 10th anniversary calendar shoot for Carolina ACD Rescue & Rebound; and a 2018 calendar shoot for Lagunitas Brewing Company, where they will be identifying a rescue beneficiary for calendar sales. All in, these projects took about 80+ donated hours between travel, shooting, editing, final production and, for Milk Paws, additional coordinating and correspondence time with participants. I knew it was time consuming but until I saw my timesheets, it hadn't occurred to me just how much! Through each process, I met some awesome people and a bunch of beautiful dogs and I hope each effort proves to be a successful fundraiser for the individual rescues. So if you are looking for a 2018 calendar, I can certainly direct you toward some options! June 26, 2017 | Why Pet Photos? If you believe your pet is a member of the family, why would you NOT want to have beautiful photos? Sure, cell phone photos will work in a pinch when your dog is doing something goofy – I do it with my own dog - but when you someday want to print a nice piece for your wall, you will be sorely disappointed in the quality your cell phone photo will provide - and the opportunity is lost. Cell phones may allow you to take selfies with your pet, but how will you properly catch that moment where your dog is looking at you with the most amazing eyes, where you can feel them burning into your soul? Or where you are playing ball, or laughing at how they perceive bubbles? While animals don’t have the same life milestones as children (recitals, graduations), they do have birthdays and even adoptaversaries. They sometimes come to you as puppies and, in the blink of an eye, you realize you have an adult dog. Then you look back and all you have are low-resolution cell phone snaps. Maybe they have come to you as a shy, rescued pet and you want to remember how far they have come. Their lives are so much shorter than humans, why would you NOT want professional photos, documenting their journey with you? 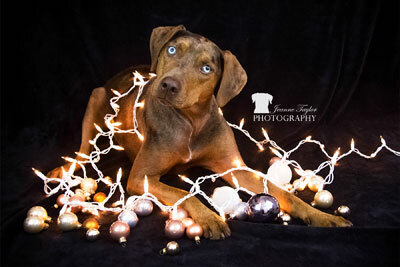 Pet photography is a specialty – there is a way to communicate with - and an energy that works well around - animals and it is not a skill everyone has. It requires patience and calm, and a physical presence that allows you to get down on the ground and roll around and be jumped and licked and body slammed and take it in stride. It requires a desire to be friends with the animal and not just photo them from a distance. 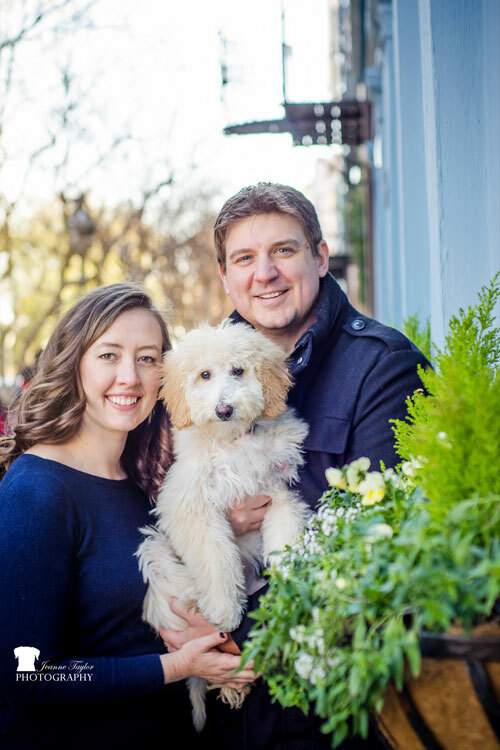 As you consider having photos of and with your pet, this is critical to keep in mind to ensure the most genuine photos result from your session. They really are not "just photos". They are memories you are making and when memories fade, photos will remain as a beautiful reminder. June 8, 2017 | It’s time for some looking ahead and adjusting. Being in a new geo-market for just about the last year, I can now better assess the differences between this area and the Northern VA client base I enjoyed for almost ten years. Changes are coming. Stay tuned and wish me luck! March 2, 2017 | When you are getting married, you interview wedding photographers - you want to know if you connect with them. Does their style suit yours for this important day? For me, it's the same with pets (and any specialty area, really). Do you want a commercial/food photographer snapping your precious Fido? Or do you want someone who is experienced working with and bringing out the best in your pet? Do you want someone who focuses on your pet, or considers them more of an afterthought? And most importantly, do you want someone who lives and breathes pets?! (This is especially important for shy pets or those who are a little weary of strangers.) And these should be key questions if you are considering professional photos of your pet. There is so much more to "pet photography" than asking a pet to sit with their family for a posed photo (although this is, indeed, a part). There is interaction, and documenting a genuine love that exists between people and their pets. There is catching a particular look that is meaningful to the pet parents, and grabbing a piece of the pet's personality in a photo. Look at sample photos. 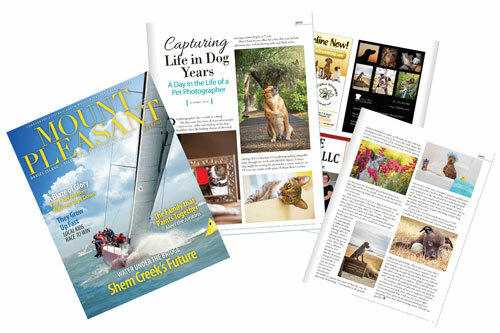 A huge, beautiful body of work with a couple of dogs sprinkled in the mix over a several month period of time just doesn't say "pet photographer" ... at least not to me. February 19, 2017 | I do believe I have a new obsession: dock diving! And I think Roux could excel at this. He loves the water, he is over the moon about his toys and he can jump like a kangaroo! A few photos from the 2017 Southeastern Wildlife Exposition (1st day, Qualifying Round) so you can see where/why I got the bug. January 1, 2017 | Happy new year to all, human and furry! 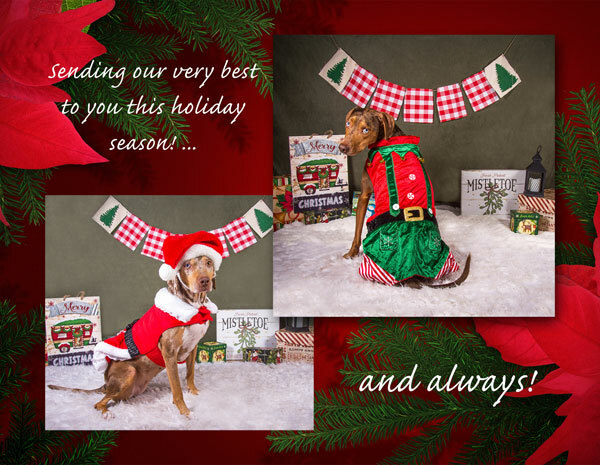 December 8, 2016 | From Roux and me -- Merry Christmas, Happy Hanukkah, Happy Holidays ... whatever brings joy to your ears and heart! October 1, 2016 | To commit to a specialty area in photography, you have to focus (no pun intended). Mine is primarily pets and their people. Of course, I can and have done other forms of photography – portraits, family, fine art, events, weddings and commercial. And I will make exceptions for prior clients, for example, who are maybe getting married, and are incorporating their pets in the ceremony! I think you have to work at everything to see where your passion lies, and, in my heart, I do believe capturing the beauty of our pets (and adoptables) and their relationships with their people is my purpose. So when you are considering photos of (and with) your pet, keep that in mind. Does the photographer you are considering specialize in pets or are they a wedding photographer that will take a pet gig? Are they primarily a family photographer that will let the pet participate in a few photos? That’s not my style. If, instead, you want someone who knows how to really interact with animals so they are comfortable, who will ensure the shots represent your pet’s personality, and will focus on your pet (and your relationship together), then let’s chat. July 25, 2016 | When we are in the middle of your session and I encourage you to be photographed with your pet even for just a few images, please trust me. I don't want to hear you are not photogenic (let me decide that! ), or that you didn't do your hair or make-up (your pet won't care about that either). Years from now, I promise, you will be glad you conceded to my request as you look back lovingly on your photos from our time together. July 2, 2016 | Moving means no file access to prep orders until the week of July 19. Thank you for your understanding. April 28, 2016 | I've noticed recently when I meet new dogs either at sessions, or dog parks, or events, so many owners seem compelled to say "He/She is a rescue" as if it's a bad thing, a reason or an excuse of some sort for a dog's insecurity or shyness, for example. How about we try this spin -- if your dog is a rescue, tell people but tell them PROUDLY! Educate them if they aren't on the Adopt-Don't-Shop bandwagon. Explain how saving a life is really saving two because you make room for another animal in need to enter a shelter and have a chance at adoption. Maybe your pet has issues - so what? Purebreds and show pets do too! No need to advertise what doesn't matter, when what DOES matter is that you cared enough to give them a chance at a loving family. And in the end, that is ALL that matters to the animal. "What kind of camera do you use?" and "What settings did you use for that [particular] photo?" My gear works for me but it may not be suitable for you. I don't debate brands. During sessions or personal projects, I tweak my settings to suit the occasion and I look for moments. For those hoping to replicate or reproduce an image, and thinking that mirroring the settings or equipment used will do the trick, it isn't going to happen because a moment is unique. I follow the images of people whose work I admire, and if I see a feature I like or am drawn to, I try to find my own way to design an image that may elicit a similar response. But I don't want to copy the work of another. Photography is, after all, a creative sport! And the cringeworthy "Do you think you got some good shots?" The short answer to this is "OF COURSE!!!" And this will always be the answer because I will shoot until I am satisfied with the images we create during our time together. January 1, 2016 | Resolve to be your best self. 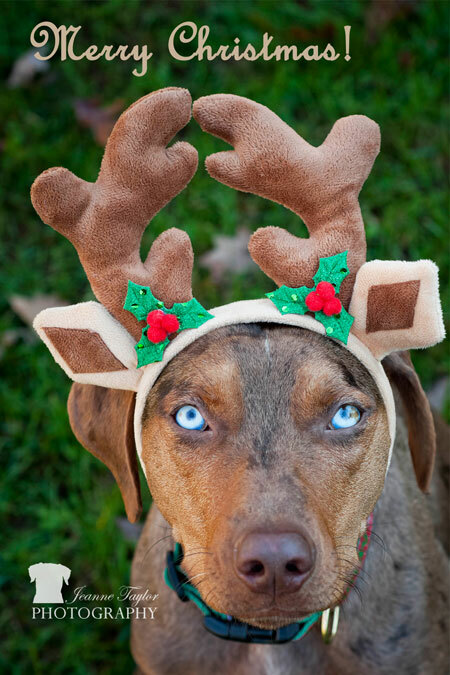 December 18, 2015 | Merry Christmas to all and an abundance of good wishes for 2016, from my favorite reindeer and me!